The business card represents your company’s brand. Not only does it convey important personal contact information such as name, title, email, website, address and phone number, but oftentimes it is also the first exposure to the overall image of the business. The company logo is prominently displayed for brand identity. The fonts used, color, texture and paper stock used also conveys a message about the type of industry represented. Specialized printing techniques can be used such as embossing, foil stamping, thermography or laminating. The business card reflects the personality of the company and gives the first impression. Image is everything. Having a business card on hand gives the appearance of professionalism and shows proper planning. Being caught off-guard without a business card imparts an ill-prepared impression. 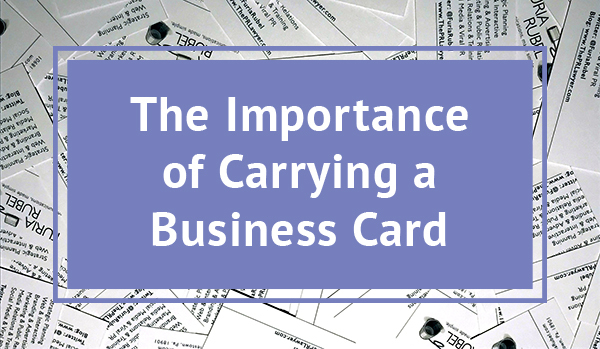 Always carry a stack of business cards protected by a card case and you will convey a polished quality. Numerous apps exist for smartphones to transfer contact information wirelessly; however the quickest and easiest way to exchange data remains the paper business card. Multiple business cards can be handed out in seconds at a networking event versus entering data. In the fast-pace workplace, time matters and nothing beats the quick handing over of a business card for speed. Do not rely on smartphones for transferring of contact information, because some people do not own digital devices or are not tech savvy. While the majority of our population does have a personal electronic device, some prefer not to rely on theirs. And even if digital devices are used by both parties, the applications may not be compatible. Exchange business cards and you can always follow up with an email that contains your digital contact card. With the rise of global working opportunities, doing business overseas is becoming more normal. Business cards are not only necessary in international business in some cultures, but they are also used ceremoniously. In most Asian countries, the business card is treated with respect. It is often presented with two hands, never tossed, and should be properly placed in a holder once received—never shoved in a pocket. In Japan exchanging business cards is a ritual and considered a formal introduction to a person. Business cannot begin until business cards are exchanged as this signifies the beginning of a relationship. In India, business cards are exchanged even in non-business situations and are always presented face-up with the text facing the recipient. In the Middle East, protocol varies per country. In Bahrain, for instance, never exchange business cards with the left hand and be certain to look at the business card received carefully before putting it away. The printed business card still dominates. At any instance, whether a networking event or at a coffee shop, the opportunity for a business connection can occur. Not having a business card on-hand could result in a lost potential client. Exchanging business cards gives the ability to follow up, providing a foot in the door for a business transaction. It also allows a personal encounter between two parties, a crucial element of creating a business connection.